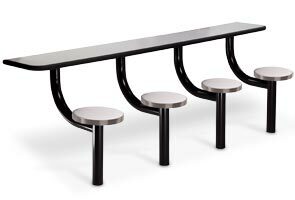 When strength and durability are a must, this is the cafeteria table for you. Originally designed for use as prison furniture, this table is built with heavy-duty steel tube legs that will hold up to 3,000 lbs. If space is a consideration, this wall-mounted style table is a perfect choice. 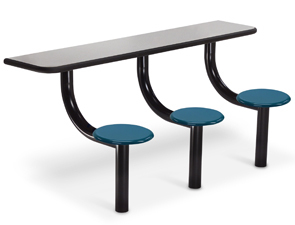 This correctional furniture is suitable as counter type seating or expanded desk space. Great for diners, libraries, study areas, and jail cells. Maximum security hidden bolt-down legs feature a concealed concrete expansion anchor and tamper-resistant fasteners. The table tops are available in a decorative high pressure laminate or stainless steel inlay. All frames and table top edges are black. Super Slammer Stone seats are a 13" diameter round stool design made from a high density, color impregnated, compression molded composite that is scratch and stain resistant. Available in multiple colors. A stainless steel seat option is also available.